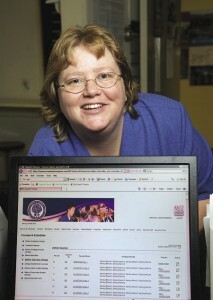 Bishop Grimes Prep Director of Guidance Susan Nedza thinks the web-based MyStudentsProgress helps further communication. When the 2010-2011 school year began, the diocesan elementary schools and three of the five diocesan high schools began to utilize a new web-based student information system called MyStudentsProgress.com. By processing pertinent student information, the computer program facilitates communication among teachers, parents and admin­istrators, while also helping administrators better manage their schools. It also enables the Catholic Schools Office to generate student data reports. By the end of the year, every school will be using it. MyStudentsProgress allows parents and students online access to students’ assignments, grades and activities from any computer with a connection to the Internet. The program includes 20 different modules, which are online notification or tracking portals to provide information for teachers, parents and administrators. Modules include access to a student’s homework assignments, report card, conduct reports, attendance, after-school activity schedules, lunches and lunch account balances, as well as school calendars and bulletins. In addition, teachers can process their grade book information online, and teachers and administrators can communicate with parents through group e-mail announcements. Student information is locked and can only be accessed by each child’s parents. The parents’ accounts are very secure with each page specially encrypted, similar to a bank web site. Bishop Grimes Prep is the only high school using the program’s parent portal. Susan Nedza, director of guidance, described the system as “fantastic.” By using the parent portal, parents can keep track of their children’s progress. They are aware if their children haven’t turned in their homework or if they failed to make up a test. Michael Powers, principal at Rome Catholic School, said that Rome’s teachers and staff have all been trained to use the new system. The teachers are currently tracking daily attendance and grades on the new computer system and using it to generate report cards. Claudia Mathis a staff writer for the Catholic Sun.